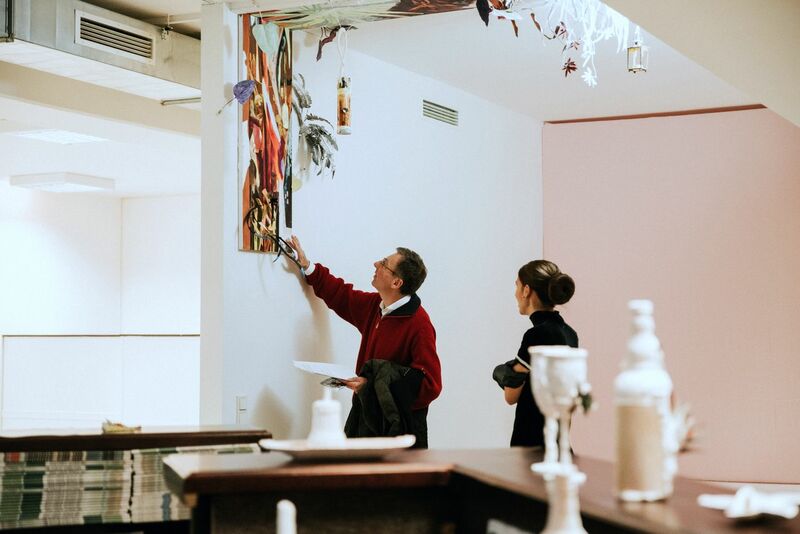 with 3D HOTEL visitors can immerse themselves in the artwork and experience it with all their senses. A hotel room, with pieces of furniture on which art objects are placed, is the best host for my project. Each time it is exposed, it takes another form, according to the new space. The visitors are invited to investigate the ‘crime scene’, flip through files with evidence, and try to understand who the main character was, and what happened to her. they can see pieces of evidence of the glass that she drank from, the book next to her bed and the dress that she wore, covered with cement. Even the ceiling carries her personality, and it seems like in her short stay at the hotel, the impersonal room transformed, and became a mirrored image of the investigated character. I had the honor to collaborate with four great artists for this exhibition. Each of them made a folder with pieces of evidence, imagining their own story. "A pink hand-made cotton bed sheet, two ashtrays made out of sea shells and a somewhat fancy baroque plate, these were the items that didn't belong to the hotel. The room had an overall salty and earthy scent, indicating provenance from a small town, most likely near a sea or ocean". "She was a non-human creature"
"[...] Miss Yvette Keith was reported missing two days ago by the receptionist of the Connect Hotel, by the name of John Lee". our person uses a lot of fragments of tattoos. It's a way to strip her personality of the precedents happening in her life [...]. Team: need to be replaced immediately_"